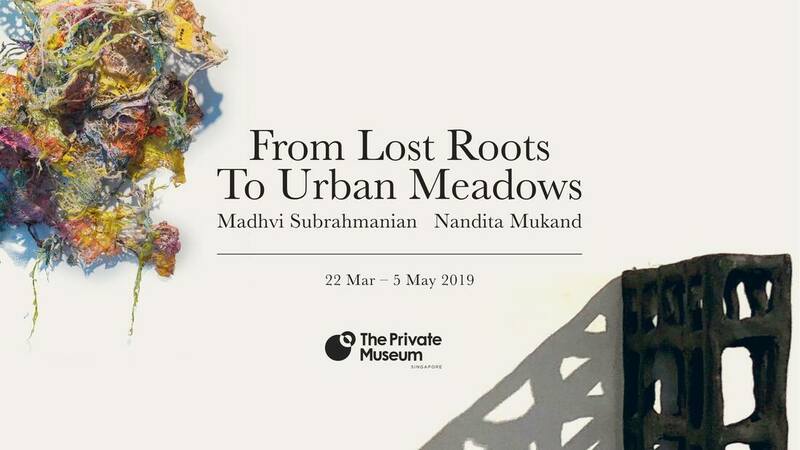 In celebration of International Women’s Day 2019, The Private Museum (TPM) is pleased to present From Lost Roots to Urban Meadows by Singapore-based artists, Madhvi Subrahmanian and Nandita Mukand. As part of TPM’s Women Artists series, this joint exhibition follows the most recent developments of the artists’ practices, featuring installation and sculptural works informed by their ongoing explorations into nature and how it responds to our everyday life in the city. Subrahmanian reflects on the fluid interconnectedness of nature and urban cultures. Bringing together conceptual and sensory experiences, her works are often participatory and/or immersive in nature. Her contemplative process attempts to trace the imprints of the intangible through her investigations into city structures, space layouts, archaeological sites and the displacement of objects by shape-shifting shadows. Drawing upon her interest in metaphysics and its abstract concepts such as being, knowing, identity, time, space; and neuroplasticity, Mukand's practice observes the deep intricacies of nature, mingled and merged with the working of the urban mind. Through the amalgamation of synthetic and organic materials, her works ruminate upon citified mindsets and illuminate urban veils that separate us from nature. Through the inquisitive lens of both the artists, From Lost Roots to Urban Meadows seeks to challenge our perceptions of nature and life – inviting the viewer to delve deeper and engage in new conversations about our urban existence—with or without—nature. 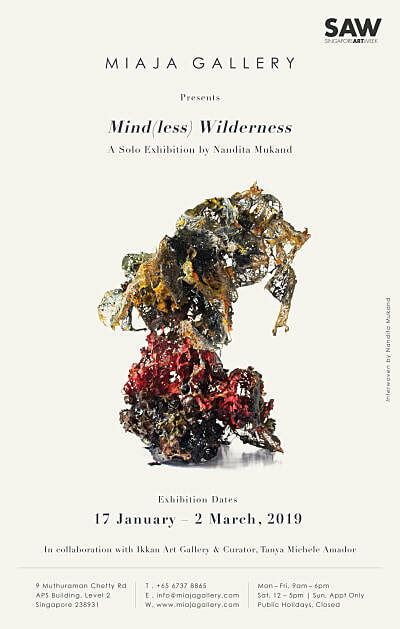 Miaja Gallery, in collaboration with Ikkan Art Gallery, will present Singapore-based artist Nandita Mukand’s solo exhibition “Mind(less) Wilderness”, curated by Tanya Michele Amador from 17 Jan to 2 March 2019. In collaboration with Ikkan Art Gallery, this exhibition mingles observations of how plants grow in the forest with the workings of the urban mind. Drawing upon diverse resources such as neuroplasticity, quantum physics, contemporary Buddhist texts, and ancient Vedic literature, Mukand presents paintings and sculptures using a myriad of both synthetic and organic materials. Weaving together objects found in nature, such as seeds, with paper and encased in resin, she intertwines her chosen ingredients with threads of cloth, signifying the ways in which today’s urban life is interconnected while mourning the contemporary belief systems that restrict our true potential. 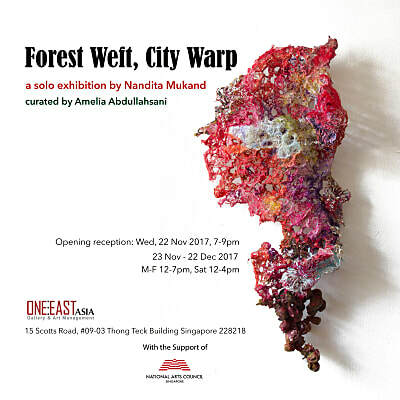 “Forest Weft, City Warp” is an exhibition showcasing Nandita’s latest body of work of three-dimensional paintings. These new works stem from her tradition of painting, the weft of which she has warped into a medium of her own invention. Using everyday materials – fabric, wax, thread, paint, wool, rope, and plastic – Nandita explores the poetics of space in the three-dimensional paintings, inspired by nature and its essential role in the built city landscape. This new body of work deals with nature and materiality, exploring themes of connection and spirituality within an urban context. In these sculptural paintings, on which she has been working for the past two years, Nandita utilises a variety of materials including cloth, the interwoven threads of which signifies how urban life today is intertwined and connected through myriad means. The actions of a city dweller directly affects not only the rest of the city and its population but also nature. Not only does material matter, the process of art-making plays an important role in this discussion of nature – the different layers are laboriously handmade. The forms and textures of her work are often created by moulding the material to the bones of her hand – the traces of the human body become forms resembling flowers, corals, and fungal growth. It is the combination of material and process that weaves the cosmic fabric together. This blog records the events, processes, experiences and thinking that make up my artistic practice. If you would like to receive regular e-mail updates, please leave your email address here. Nandita Mukand is a Singapore-based artist. Her work deals with the relationship with Nature and spirituality from within the contemporary urban context. She employs materiality to question the impact urban life has on our experience of time and the meaning we give to our own existence.